VANCOUVER, BRITISH COLUMBIA, December 18, 2017 - Millrock Resources Inc. (TSX-V: MRO, OTCQX: MLRKF) ("Millrock") is pleased to report results from a stream sediment sampling program carried out on its Todd Creek project. The survey covered an area measuring 6 kilometers by 16 kilometers. Multi-element anomalies were returned in areas of known base and precious metal mineralization which extend for 10 kilometers along the Todd Creek valley. The valley reflects a major faults system that appears to control and localize base and precious metal mineralization. The area around the previously documented Falls Creek, Orange Mountain and Yellow Bowl occurrences were found to be anomalous in gold, silver, copper, lead and zinc over an area measuring approximately 1.5 kilometers in diameter. Pathfinder elements of cadmium, barium, phosphorous and antimony were strong, and tellurium, a mineral frequently found in association with gold, was particularly anomalous in seven samples collected in a one-kilometer diameter area. Additionally, two new prospect areas were also highlighted. These have been named Surveyor and MJ. The map included as Figure 1 shows the location of the Todd Creek property in relation to the adjacent claim blocks held by Pretivm and Seabridge, upon which are situated the Brucejack high-grade gold mine and the KSM porphyry copper-gold deposit, respectively. Figure 2 shows the new anomalous areas and other surface mineral occurrences that had been documented by prior workers. The Surveyor area is anomalous in gold, silver, copper, molybdenum, lead, zinc, and pathfinder elements cadmium, antimony, tungsten, sulfur and phosphorous. Of particular note is strong nickel anomalism. The area is primarily underlain by Lower to Middle Jurassic volcanic and rocks of the Hazelton Group, a stratigraphic level known to be productive for mineral deposits in the Golden Triangle District. Previously in 2011 geophysical surveys were compiled and processed by an earlier property owner. A Versatile Time Domain Electro Magnetics (“VTEM”) survey and magnetic survey were examined. Several conductive zones with a strong magnetic disruption response were noted in the vicinity of the Surveyor geochemical anomaly, and are potentially indicative of porphyry-style mineralization. These coincident VTEM, mag and multi-element stream sediment anomalies that comprise the Surveyor prospect will be a priority for follow up in 2018. A total of 238 stream sediment samples was collected in the 2017 program. The sampling work was done under contract by Equity Exploration Consultants Limited (“Equity”) in September 2017. The following table summarizes the results. There are numerous, known occurrences and small deposits documented on the property and large alteration zones indicating significant mineralizing systems. The Todd Creek project is described in more detail on Millrock’s website at this link. Millrock adheres to stringent Quality Assurance – Quality Control (QA/QC) standards. All samples were collected by Equity Engineering Consultants Ltd. (“Equity”) personnel under contract to Millrock and securely stored until delivery to the ALS Minerals prep lab in Terrace, British Columbia. After preparation, the samples were sent for analysis at the ALS Minerals Ltd. North Vancouver, BC laboratory, a 17025:2005 certified facility. Equity implemented a QA/QC program utilizing duplicate sampling and blanks at an average rate of one duplicate or blank per 15 samples. No QA/QC anomalies were noted in the analyses. All results from blanks, standards and duplicates were reviewed and found to be accurate within acceptable tolerances for results obtained to date. VANCOUVER, BRITISH COLUMBIA, December 15, 2017 – Millrock Resources Inc. (TSX-V: MRO, OTCQX: MLRKF) ("Millrock") reports that the non-brokered private placement announced on November 28, 2017 has closed and a total of 6,970,000 Units (the “Units”) at a price of $0.25 per Unit were issued for gross proceeds of $1,742,500. Each Unit consisted of one common share and one share purchase warrant (a “Warrant”) entitling the holder to purchase one additional common share for $0.35 per Share until December 15, 2018, thereafter for $0.45 per Share until December 15, 2019 and thereafter for $0.55 per Share until December 15, 2020. Finder’s fees were paid as follows: $600 to Sprott Private Wealth LP, $41,325 to Sprott Global Resource Investments, Ltd., $10,500 to Red Plug Capital Corp, $3,000 to Canaccord Genuity Corp., $4,200 to Haywood Securities Inc. and $600 to Leede Jones Gable. The common shares, Warrants and all common shares issuable upon exercise of Warrants are subject to a four month hold period and may not be traded until April 16, 2018. VANCOUVER, BRITISH COLUMBIA, December 7, 2017 - Millrock Resources Inc. (TSX-V: MRO, OTCQX: MLRKF) ("Millrock") is pleased to announce that sampling results for a comprehensive stream sediment sampling program and a targeted soil sampling program have been reported by partner Sojourn Exploration Inc., (TSX-V:SOJ) (“Sojourn”). The work program was recommended by Millrock as a logical follow-on step from the airborne geophysical survey and data compilation exercise that it had completed in 2016 – before Sojourn optioned the property. The geophysical surveys had identified a series of thirteen porphyry copper-gold targets, as well as five targets thought to represent possible volcanogenic sulfide mineralization. The work was funded by Sojourn and indicates strongly anomalous metal concentrations in the immediate vicinity of several of the high-potential geophysical targets. Sojourn is earning a 100% interest in the Oweegee Dome property from Millrock by making share issuances totaling 2,300,000 common shares and completing $2,000,000 in exploration over the next three years. Millrock holds a production royalty on the large claim block, which exceeds 300 square kilometers in area. It is located 75 kilometers northwest of Stewart, British Columbia, and is bisected by Highway 37 and the Northwest Transmission Line. Millrock adheres to stringent Quality Assurance – Quality Control (QA/QC) standards. All samples were collected by Equity Engineering Consultants Ltd. (“Equity”) personnel under contract to Millrock and securely stored until delivery to the ALS Minerals prep lab in Terrace, British Columbia. After preparation the samples were sent for analysis at the ALS Minerals Ltd. North Vancouver, BC laboratory, a 17025:2005 certified facility. Equity implemented a QA/QC program utilizing duplicate sampling and blanks at an average rate of one duplicate or blank per 15 samples. No QA/QC anomalies were noted in the analyses. All results from blanks, standards and duplicates were reviewed and found to be accurate within acceptable tolerances for results obtained to date. VANCOUVER, BRITISH COLUMBIA, November 27, 2017 - Millrock Resources Inc. (TSX-V: MRO, OTCQX: MLRKF) ("Millrock") is pleased to announce that sampling results have been reported by partner Sojourn Exploration Inc., (TSX-V:SOJ) (“Sojourn”). 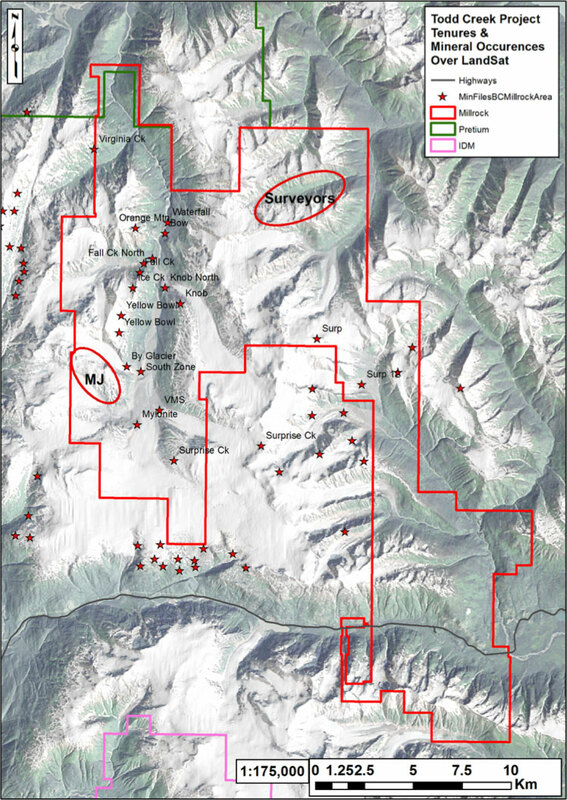 Sojourn indicates in their press release that it has discovered important new zones of mineralization at the Willoughby Project, located in the Golden Triangle district of British Columbia, during the Company’s recent surface prospecting program. The new zones of bedrock mineralization are located in some of the freshly exposed bedrock revealed by recent retreat of glaciers and snowfields. VANCOUVER, BRITISH COLUMBIA, November 23, 2017 - Millrock Resources Inc. (TSX-V: MRO, OTCQX: MLRKF) ("Millrock") is pleased to announce that PolarX (ASX: PXX) (“PolarX”) has issued a press release concerning the recently completed drilling program at the Alaska Range Project in Alaska. Results from the first five holes of the program are reported. The Alaska Range Project is a new name given to the combined Stellar and Caribou Dome projects. Assay results from the first five holes drilled into the deposit confirm the presence of high-grade copper and gold from near surface. it remains open along strike and at depth. Millrock adheres to stringent Quality Assurance – Quality Control (QA/QC) standards. Drill core and samples are kept in a secure location at all times. Representative quarter-core samples were collected and assayed at ALS Chemex laboratories in Vancouver, Canada and Reno, Nevada, USA. Gold was analyzed by Fire Assay (specifically ALS code Au-AA25 - Au by fire assay and AAS using a 30g nominal sample weight). Other elements (33 in total including copper) were analyzed using ALS method code ME-ICP61 which involves a four-acid digest and an ICP-MS finish. Over range (Cu >= 1%) was analyzed using ALS method code ME-OG62 which involves a four-acid digest and an ICP-AES or AAS finish. The following QA/QC protocols have been adopted for this program: 1) Duplicates were created as coarse crush duplicates on every 20th sample in the sample preparation process at the laboratory, and 2) Blanks every 20th sample, and 3) Standards – Certified Reference Material (CRM’s) every 20th sample plus additional random insertions at supervising geologist’s discretion. All results from blanks, standards and duplicates were reviewed and found to be accurate within acceptable tolerances for results obtained to date. VANCOUVER, BRITISH COLUMBIA, October 25, 2017 - Millrock Resources Inc. (TSX-V: MRO, OTCQX: MLRKF) ("Millrock") is pleased to announce that PolarX (ASX: PXX) (“PolarX”) has issued a press release concerning the recently completed Induced Polarization (“IP”) survey at the Stellar copper-gold project in Alaska. The work was executed by Millrock on behalf of PolarX. The results from the IP survey conducted at the Mars Prospect are summarized in PolarX press release, which can be viewed here. Millrock sold the Stellar project to PolarX in August 2017 in a transaction announced here. Millrock presently owns 10.74% of the issued and outstanding shares of PolarX and is entitled to certain milestone and royalty payments. As part of the recent exploration program, drilling was done to establish a modern resource for the high-grade copper-gold Zackly deposit, also on the Stellar claim block. Assay results from the first five holes are anticipated in November 2017. VANCOUVER, BRITISH COLUMBIA, October 4, 2017 - Millrock Resources Inc. (TSX-V: MRO, OTCQX: MLRKF) ("Millrock") is pleased to announce that it has successfully completed a late-season drilling program on the Stellar copper-gold project in Alaska. The work was executed by Millrock on behalf of PolarX (ASX: PXX) (“PolarX”) (previously Coventry Resources ASX: CYY). The drilling program’s primary objective was to establish a modern resource for the Zackly deposit that meets the standards of the Australian Joint Ore Reserves Committee for mineral resource reporting. A historic high-grade copper-gold resource had been previously reported by prior workers at Zackly, which is situated on the Stellar claim block and is detailed in this summary description. VANCOUVER, BRITISH COLUMBIA, August 30, 2017 - Millrock Resources Inc. (TSX-V: MRO, OTCQX: MLRKF) ("Millrock" or “the Company”) is pleased to announce that work has begun on the Willoughby and Oweegee Dome projects in the Golden Triangle district of British Columbia. The work is being executed by Millrock, funded by Sojourn Exploration Inc. (TSX-V: SOJ) ("Sojourn"), and should be completed by the end of September. At the Willoughby project, the primary focus will be prospecting present-day glacier margins for newly exposed surface mineralization. It has been close to a decade since geologists have visited the site and during this period glaciers have been rapidly retreating. The field crew will search for mineralized zones, and if located, collect rock samples and create geological maps. Additionally, structural geology will be mapped to help understand the gold mineralizing controls. The work will be done from Millrock’s exploration facility in Stewart, BC. Meanwhile, historic paper exploration drilling records will be digitized and brought into a modern digital database and a three-dimensional model formed. 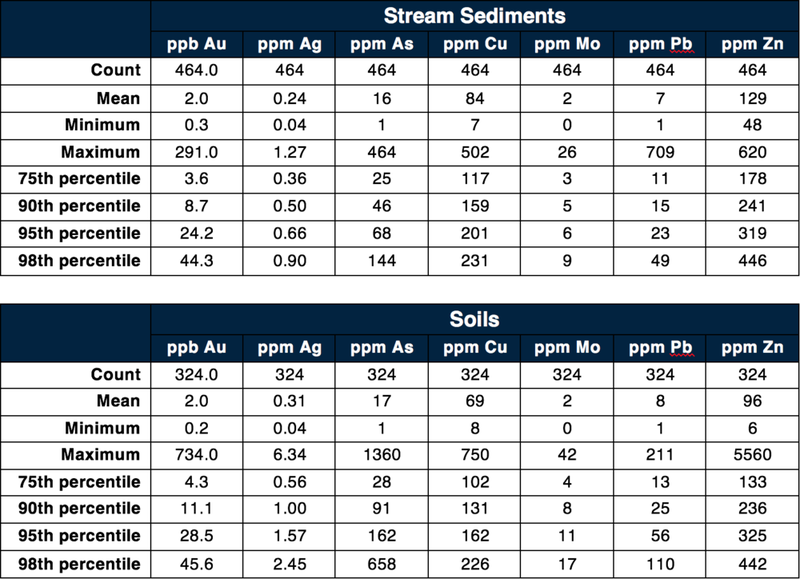 Past drilling results indicate high-grade gold results over significant core lengths as further described in an earlier Millrock press release. Prospecting, mapping, and soil sampling at each of ten high priority geophysical targets that were previously identified by the VTEM and ZTEM / Mag surveys conducted in prior years. The Oweegee Dome project is described in more detail here. Sojourn has the option to earn a 100% interest in the Willoughby and Oweegee Dome projects by making payments to Millrock in the form of Sojourn shares and by funding exploration in accordance with a set minimum schedule. Millrock is also entitled to a 2% Net Smelter Returns royalty. Millrock presently owns 12.6% of the issued and outstanding shares of Sojourn. VANCOUVER, BRITISH COLUMBIA, August 28, 2017 - Millrock Resources Inc. (TSX-V: MRO, OTCQX: MLRKF) ("Millrock" or “the Company”) is pleased to announce that drilling has commenced at the Stellar Project. The program will focus on the high-grade copper-gold deposit called Zackly. A program consisting of approximately 25 holes totaling 3,000 meters is planned. Two drills have been mobilized to complete the work. Millrock is executing the work on behalf of Coventry Resources (ASX: CYY, “Coventry”). Millrock recently sold its interest in the Stellar Project for an equity stake in Coventry. The Company presently owns 10.6% of the issued and outstanding Coventry shares. The drilling program’s primary objective is to bring the historic, high-grade, copper-gold resource at the Zackly skarn deposit to meet the standards of the Australian Joint Ore Reserves Committee (JORC) for mineral resource reporting. To accomplish this objective one drill will be used to drill approximately twelve holes through the known, historic deposit. For a description of the Stellar Project, and the Zackly copper-gold deposit, click here. A second drill will test for extensions of the deposit, both to the east and west, where induced polarization surveys indicate possible additional mineralization. Coventry also owns the nearby Caribou Dome (“CD”) copper deposit, which is reported by Coventry to have a high-grade resource that is described in this Coventry press release. A description of the CD project can be found at this link. Geological mapping and other surface work is currently in progress at CD. VANCOUVER, BRITISH COLUMBIA, August 24, 2017 - Millrock Resources Inc. (TSX-V: MRO, OTCQX: MLRKF) ("Millrock") is pleased to announce that the transaction previously announced here on June 14, 2017, has closed. Under two separate agreements, Millrock has granted an option to purchase a 100% interest (subject to a royalty provision) in the Willoughby and Oweegee Dome projects to Sojourn Exploration Inc., (TSX-V: SOJ) ("Sojourn"), previously Sojourn Ventures Inc. 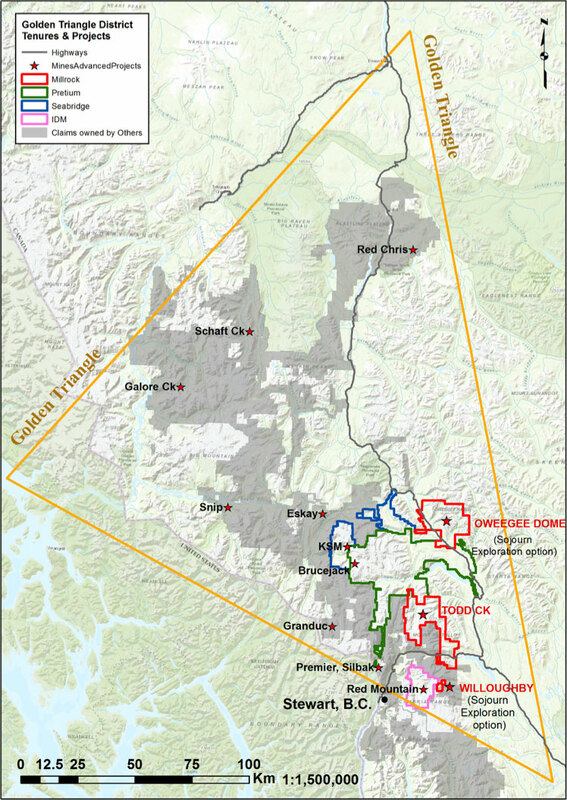 The two projects are located in the Golden Triangle mining district, northeast of the Town of Stewart, British Columbia, Canada. Under the terms of the agreements, Sojourn must make share issuances and incur exploration expenditures over three years in order to exercise the options and take ownership of the properties from Millrock. Millrock has already received the first payment of 1,800,000 Sojourn shares. The transaction also required that Sojourn complete an equity financing of at least $1.0 million. As announced by Sojourn today, the oversubscribed equity financing has been completed and the TSX Venture Exchange has accepted all components of the transaction. Millrock now owns 12.6% of the issued and outstanding Sojourn shares. Attributes of the Willoughby high-grade gold – silver project are described by Millrock in a press release found here. Exploration progress made by Millrock on the Oweegee Dome porphyry copper-gold project is described in this press release. Summary descriptions of all Millrock’s Golden Triangle district projects can be found at this link. Millrock will be the exploration operator for the 2017 program that is presently being initiated. VANCOUVER, BRITISH COLUMBIA, July 26th, 2017 - Millrock Resources Inc. (TSX-V: MRO, OTCQX: MLRKF) (“Millrock” or the “Company”) is pleased to announce that it has closed the sale of Stellar copper-gold project to Vista Minerals Pty Ltd (“Vista”). Upon completion of the deal, as previously announced, Vista successfully merged with Coventry Resources, which owns an option on the adjacent high-grade copper Caribou Dome Project. Coventry simultaneously announced that it had successfully raised AUS$5.5 million to further exploration. Upon closing of the three-way deal, Millrock now owns a 10.6% of Coventry Resources. With the capital raising and merger complete, Coventry Resources will fund a major drilling campaign on the Stellar Project, as well as surface exploration work at Caribou Dome. The program, which will be operated by Millrock on behalf of Coventry, will see two drill rigs working at the high-grade Zackly copper-gold skarn deposit. Approximately 3,000 meters are planned in 20 holes. The main objective of the program is to bring the historic, high-grade, copper-gold resource at the Zackly skarn deposit to a point that it meets the standards of the Australian 2012 Edition of the Australasian Code for Reporting of Exploration Results (JORC Code). The secondary objective is to discover strike extensions of the deposit which are inferred to exist from induced polarization geophysical surveys conducted in 2016. Drilling is planned to commence in mid-August. Further induced polarization surveys and geological mapping will be undertaken at Zackly and the nearby Mars copper-gold porphyry target. Field work will also be done at Caribou Dome. Millrock will earn a 10% management fee in expenditures and is entitled to certain milestone payments if a resource of significant size is delineated on the Stellar Project. A detailed outline of the program can be found on Coventry’s website here. For a description of the Stellar Project, click here. For a description of the Caribou Dome project, click here. Millrock Resources Inc. is a premier project generator to the mining industry. Millrock identifies, packages and operates large-scale projects for joint venture, thereby exposing its shareholders to the benefits of mineral discovery without the usual financial risk taken on by most exploration companies. The company is active in Alaska, British Columbia, the southwest USA and Sonora State, Mexico. Funding for drilling at Millrock’s exploration projects is primarily provided by its joint venture partners. Business partners of Millrock have included some of the leading names in the mining industry: Centerra Gold, First Quantum, Teck, Kinross, Vale, Inmet, Altius, Riverside, and Coventry. VANCOUVER, BRITISH COLUMBIA, June 14th, 2017 - Millrock Resources Inc. (TSX-V: MRO) ("Millrock") announces two separate option agreements whereby it has granted an option to Sojourn Ventures Inc., (TSX-V: SOJ) ("Sojourn"), which may purchase a 100% interest (subject to a royalty provision) in the Willoughby and Oweegee Dome projects in the Golden Triangle mining district northeast of the Town of Stewart, British Columbia, Canada. Sojourn must make share issuances and incur exploration expenditures over three years in order to exercise the options and take ownership of the properties. The transaction and Sojourn’s plans are more extensively described in their press release here. After the first share issuance and the equity financing contemplated by Sojourn, Millrock will own approximately 15% of the issued and outstanding shares of the company. Gregory A. Beischer, President & CEO of Millrock commented: “Historically Millrock has made exploration agreements primarily with major mining companies. However, we anticipate that shares of junior gold exploration companies will do well in the coming years. Millrock will become a major shareholder of Sojourn and as a result, our shareholders may realize the best value possible for these assets. Millrock will execute the initial exploration programs on the properties on behalf of Sojourn and in return will be entitled to a management fee. We look forward to advancing these exciting gold and copper projects." At the completion of the share payments and work commitments, Sojourn will have earned a 100% interest in the properties subject to certain Net Smelter Return (NSR) royalties. Upon exercise of the option on the Oweegee Dome project, Millrock will vest with a 2% NSR royalty. On Willoughby, Millrock will vest with a 1.5% NSR royalty. Attributes of the Willoughby high-grade gold – silver project have been described by Millrock in a press release found here. Exploration progress made by Millrock on the Oweegee Dome porphyry copper-gold project was described in this press release. Summary descriptions of all Millrock’s Golden Triangle district projects can be found at this link. Concurrently with entering into the Option Agreements, Sojourn and Millrock entered into an Investor Rights Agreement which entitles Millrock to participate in future Sojourn Placements to maintain its percentage interest in Sojourn provided Millrock holds at least 7.5% of Sojourn’s issued and outstanding common shares. The Investor Rights Agreement also entitles Millrock to nominate one director to Sojourn’s board of directors as long as it continues to hold at least a 7.5% interest in Sojourn. Millrock has also granted Sojourn a one-year right of first refusal over Millrock’s Todd Property, located near the Willoughby and Oweegee Properties. The agreements are subject to the approval of the TSX Venture Exchange, approval of an individual from whom most of the Willoughby tenures were purchased previously by Millrock, and upon completion of the equity financing contemplated by Sojourn. "NEITHER TSX VENTURE EXCHANGE NOR ITS REGULATION SERVICES PROVIDER (AS THAT TERM IS DEFINED IN THE POLICIES OF THE TSX VENTURE EXCHANGE) ACCEPTS RESPONSIBILITY FOR THE ADEQUACY OR ACCURACY OF THIS RELEASE. VANCOUVER, BRITISH COLUMBIA, June 13th, 2017 - Millrock Resources Inc. (TSX-V: MRO) ("Millrock") announces it has entered an option agreement to purchase the La Navidad gold project from a private Mexico firm, Western Mining S.A. de C.V (“Western”). The concessions under option are adjacent to surrounding concessions already held by Millrock. Together the district-scale land package covers more than 25,000 hectares in the Magdalena di Kino Mining area of Sonora State, Mexico. Simultaneously with the purchase agreement, Millrock has entered an option to joint venture agreement with Centerra Gold Inc. (“Centerra”). Centerra will fund initial exploration on the project. Work is scheduled to begin immediately. Gregory A. Beischer, President & CEO commented: “There is at least one known, moderately-dipping, near-surface structure that is reported to host gold over significant intervals. Through drilling, we look forward to verifying the previously-reported historic results and expanding the limits of the reported mineralization. Pursuing this project has been made possible through our ongoing partnership with Centerra”. Historic reports indicate that twenty-one shallow reverse circulation holes totaling 1,126 meters were drilled in 1996. According to the author of a 1999 report, thirteen of the holes intersected “significant” gold mineralization (Summary Report, La Navidad – Shelly Gold Project, F.M. Johnson, 1999). Table 1 below indicates a selection of the better historic drill results. Drilling done to date did not completely test the target. Millrock believes there is good potential to extend the mineralized zone and to find parallel zones at deeper levels. Millrock cautions that these drill results are historic and have not been (and cannot be) verified by the qualified person that is responsible for the contents of this disclosure. The results reported in Table 1 are taken from the 1996 report written by F.M. Johnson. While it is known that the drill samples were assayed at a well-known, reliable, laboratory (Bondar – Clegg of – at the time – 130 Pemberton Avenue, North Vancouver, B.C. Canada V7P2R5), the Millrock qualified person has not seen the assay certificates. No drill sample chips, rejects, or pulps were retained by Western Mining from the 1996 drilling program and the qualified person has therefore not viewed or resampled any of the rock drill samples that were assayed. The qualified person has visited the project site, observed vein structures in rock outcrop and old workings and believes that the reported drill intersections are likely to be accurate. The holes were drilled vertically, and therefore the reported intersections are apparent thickness. True width is likely to be approximately 65% of the reported apparent width. VANCOUVER, BRITISH COLUMBIA, June 8th, 2017 - Millrock Resources Inc. (TSX-V: MRO) ("Millrock") announces it has entered an option agreement to purchase the El Picacho project. The project consists of district-scale concessions that cover approximately 6,300 hectares, located in Sonora State, Mexico, 18 kilometres southwest of the San Francisco Gold Mine which is operated by Alio Gold Inc. The target is an orogenic gold deposit of similar scope to that present at San Francisco. The project was identified to Centerra Gold Inc. (“Centerra”) by Millrock, and Centerra has agreed that El Picacho will become a “designated project” under the terms of the strategic alliance agreement (“Alliance”) in place between the companies. The Alliance was announced here in early 2017. Centerra has provisionally approved a US$460,000 exploration budget for 2017 for the El Picacho project.